For film lovers of all stripes, the launch this month of FilmStruck, a new streaming service partnership between Turner Classic Movies and the Criterion Channel, is nothing short of a major event. 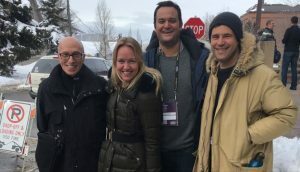 As Netflix tilts more and more towards television and original programming, and actual movies cycle on and off on-demand services at a dizzying pace, FilmStruck is poised to be a dependable and invigorating destination for anyone wanting to watch a simply great movie at any time of the day or night. 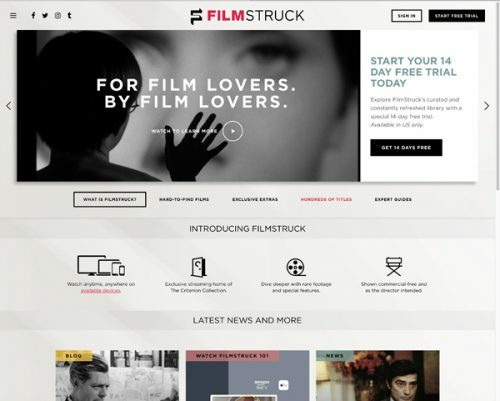 FilmStruck will source films from indie distributors such as Janus Films, Zeitgeist, Film Movement, Oscilloscope Laboratories, as well as studios like Warner Bros. and MGM. In addition, it will be the exclusive home of films from the storied specialty film home video distributor, the Criterion Collection. But if FilmStruck simply consisted of these great libraries, it’d be something to celebrate but not much to write more about. Fortunately, as you’ll read below, FilmStruck is, straight out of the gate, a more ambitious enterprise, and that’s in large part due to its add-on channel, The Criterion Channel. The Criterion Channel’s aim is to bring not just great films but a sense of film culture to the home viewer, and it is doing that by reimagining Criterion features like bonus tracks and video extras for the streaming age. It’s also doing original programming and imaginative partnerships with critics, programmers, filmmakers and arthouse curators. (And it has a great new film blog, Streamline, too). FilmStruck’s monthly fee is $6.99, with the Criterion Channel adding on an additional $4.00. The two together are bundled together for a yearly $99 fee. Over at his blog, David Bordwell, who will be contributing to the new channel, has a bit more. Criterion President Peter Becker has a welcome post here, and a two-week free trial is currently being offered. I met with Becker last month in the Criterion offices on Park Avenue South in Manhattan. The surprisingly large space where, Becker told me, Criterion supplements and bonus materials are created in-house, was crackling at the time. Criterion’s 4K restoration of Juzo Itami’s Tampopo was opening at the Film Forum in just a few days, a 50%-off online DVD flash sale was in its final hours, and, spread across a conference table was an early copy of perhaps Criterion’s most intricate production to date, a gloriously designed box set of Guillermo del Toro films called Trilogia. Sitting down in his office, Becker and I talked for an hour about FilmStruck and the Criterion Channel, covering not just the basic launch information but also future plans, challenges, and whether or not Becker thinks this Criterion streaming service will cannibalize the company’s existing home video business. Filmmaker: So, you’re days out from launching — how are you feeling? Becker: I am exhilarated — and it’s not just the Stumptown coffee. It’s an exciting moment. Since the initial announcement [of Filmstruck] in April, it’s been a sprint, and I’m very happy with where we are. Filmmaker: And what’s been your biggest worry, or concern, these past few months? Becker: My biggest concern was that we’re being given the opportunity to build a channel, a streaming service, and what are we going to do with that? We’re known for thinking about how we use technology to fulfill the mission of presenting films — not just in high-quality versions, the way filmmakers want them seen, but with supplemental content and all that kind of stuff. So we knew that that experience was going to be core to the whole undertaking, for both FilmStruck and Criterion Channel on FilmStruck. But for the Criterion Channel, where we really had our own playground, the question was, what do we want to do there? It’s always been part of our identity to think about how we use technology on behalf of the mission, and that goes back to the first commentary tracks on our laser discs. Originally we could only do commentary tracks on mono films, because the laser disc only had analog tracks and only had two of them. You had to put the commentary on the left channel and the movie on the right channel and use your balance knob to kind of mix your commentary on the fly. Laser disks also had a still frame [function], so we could make text supplements and put in photographs and integrate little pieces of video. And that was really the birth of all of this stuff — just using technology that existed then in the best way and on behalf of the audience. Filmmaker: Let’s discuss the experience of watching on Filmstruck. What differentiates you from the outset besides your catalogue? Becker: FilmStruck, which is the primary channel, is all curated in themes. So right from the beginning, you’re in a different space than a large, diversified streaming service, where there’s a certain amount of brute force curation happening, usually by genres and categories and things like that, but where there’s not a lot of guidance. FilmStruck will have this rotating selection of themes, and films will come on and off the service, both from our library and from studio and independent libraries. And then, within the service, there is this tier, the Criterion Channel, which is wholly programmed by us. So FilmStruck is programmed with total access to all of our library of content, films, supplements, and everything, but by the TCM team. And then the Criterion Channel is programmed by us and has a slightly different feel and approach. The [Criterion Channel] programming is based on two kind of categories or principles. The first, because we want the Criterion Channel to be a dynamic environment, is a weekly rotation. So on Mondays and Thursdays, we will introduce or highlight thematic programming. The thematic programs range from political cinema of the ’60s to a series of double features focusing on creative marriages — Fellini and Masina is the first one, but then Rossellini and Bergman, Anna Karina and Jean-Luc Godard. This first piece of the puzzle, being able to curate thematically, is huge. We think dropping people down in a world of choices in this time of media saturation is not necessarily the best experience; we think people might actually like just being invited to watch something. So on Tuesday nights, we’re going to show a short and a feature, often a contemporary/classic matchup. On Wednesdays, we will feature a complete Criterion edition, with all of its supplements, as a theme in itself. And really, that’s where you’ll see a lot of films cycle in that we never had the ability to show on Hulu. When McCabe & Mrs. Miller comes through the service, that’s where it will turn up, and it will only be available on the channel for a limited window, because we don’t have perpetual rights. Thursday is another thematic programming evening, and Friday night, we’re going to show a double feature. The double feature will often include a film from outside the regular Criterion collection. The first double feature after launch will be, I think, M and Silence of the Lambs, which is exciting because Silence of the Lambs is an out-of-print edition with a great commentary track. There’s no other streaming service that I know of where you can go and play commentary tracks on the films. And then there will be what in our minds are “the specials.” As with our editions, we will take the time to make them good, which means that we aren’t necessarily going to commit to having a particular rhythm at the outset. Sometimes, we’re going to have to wait for talent, and sometimes, we’re going to have to wait for archival licenses. Filmmaker: Can you give us a few examples of some of these specials and other types of programs? Becker: There was a French series called “Cineaste de notre temps,” where Andre Labarthe sent filmmakers out to make films about other filmmakers; he sent Jacques Rivette out to make the film about Jean Renoir. So we have a series called “Meet the Filmmaker,” where we send one filmmaker out to make a film about another filmmaker. These are not filmographies or biographies; there are plenty of those out there. The idea is that this growing body of “Meet the Filmmaker” films, which we’re commissioning, will become a lasting resource for our audience and will grow over time. The first one is on Athina Rachel Tsangari; David Thompson made it in Greece this summer, and it’s a little shy of an hour long. This will only be on the Criterion Channel, and when it plays, we’ll also show her films. We’ll show Chevalier, we’ll show Attenberg, we’ll show The Slow Business of Going, which is very hard to see, as well as her shorts. Now those films will be on a limited-term license, and at some point, they will leave the service, but the documentaries are meant to be of lasting value. And as we make more of these about more filmmakers, that is a resource that will grow. Another example of a special is something called “Adventures in Moviegoing,” a series where we let dedicated cinephiles from any walk of life — the art world, the fashion world, the music world, paleontologists, magicians — take us on little tours of odd corners of cinema culture. Another is “Observations on Film Art.” David Bordwell, Kristen Thompson and Jeff Smith are the authors of the canonical Film 101 textbook, Film Art: An Introduction. They are doing for us what are essentially film school micro lectures — five to seven minutes — on very specific subjects. In the first one, Jeff Smith opens up the simple idea of musical motifs in the classical Hollywood score by looking at an Alfred Newman score — not a massively inventive Alfred Newman score, but a more typical Hollywood score for Foreign Correspondent. We’ll also show Foreign Correspondent, too, so you can watch this little micro lecture and then the film. We hope these micro lectures will happen monthly. There’s one coming up on camera movement in Kieslowski’s films. There’s one on Kiarostami. Sometimes people have called [Criterion] “film school in a box,” and this will be a really exciting way to bring genuine, credentialed film scholarship into people’s lives. And that’s something I can’t do anywhere other than on a streaming service. And for the first time, we can publish what might’ve been supplemental material to a disc but without a disc to attach it to. What a relief that is! Think about how frustrating it is to be responsible for films that generate ongoing cultural commentary and for which new film materials are being discovered all the time. Deleted [scenes] are being found, old archives are opening up. How frustrating is it to have a film like Rules of the Game or Seventh Samurai that will never be out of the conversation but only to be able to talk about it for the six-month period you are actively producing that edition? And, thereafter, unless you really think it’s compelling enough to create a new edition around, there’s no way to bring anything new that surfaces to our audience. Now the conversation about Seven Samurai can continue on the channel because we can add a supplement any time we want. There is a series that we will do celebrating arthouse theaters across the country, where we will go to arthouse programmers. I want to try and highlight those theaters, to make little documentaries about their histories, missions, vibes, and programmers. And then, to invite those programmers to program to a national audience. You know, we have food tourism in America, we should have cinema tourism. I want to let Courtney Sheehan of the Northwest Film Forum take over the channel and make a series. I want Toby Leonard at the Belcourt to take over and make a series. I want to go to Film Streams in Omaha and let Rachel Jacobson do something. Maybe we’ll do a Criterion Live event there and shoot something with Alexander Payne. The live event we did at the Metrograph on the films of Robert Drew is a sort of prototype for this, and that’s on the channel. I think it’s important for people to realize that film culture is all across the country, that it’s not just on the coasts. I would love it if somebody passing through Nashville wanted to stop by the Belcourt because they had seen Toby Leonard’s program on the Criterion Channel. How fantastic would that be? Programmers are not nearly celebrated enough. Filmmaker: That’s an awful lot of stuff right off the bat. Becker: That is a lot, and there are other things. For example, Janus is releasing Cameraperson right now. For me, what’s miraculous about that film is that it has a satisfying documentary arc that exists neither in the picture nor in the soundtrack or because of your attachment to any of the characters on the screen. It’s like a magic trick; I don’t even understand how it works. So Kirsten was invited out to the Traverse City Film Festival by Michael Moore, and they were going to have a conversation. We thought, “Let’s go film that.” The subject is “Unintended Consequences of Documentary Filmmaking for the Filmmaker and for the Subject.” What a great subject, and so fitting for Cameraperson. So we got a crew to shoot it. Filmmaker: Let me ask you about the core audience. I pretty much do not buy physical media anymore, with one exception, which is your disks. And I buy them for all the reasons that other people buy them — because of the supplements and because they are films I love and feel a connection to and are beautifully packaged. They feel justified as physical objects in my apartment. And so, you’ve created this rarefied space, where someone like me, who has largely moved away from physical media, still is incentivized to return to. Are you worried that people like me are going to be pushed by FilmStruck to stop buying physical media? Or is that kind of cannibalization of your audience part of the business model? Becker: We’re still going to be making gorgeous, definitive editions on Blu-ray for a long time. The Guillermo del Toro box that we just put out, the Trilogia box, is maybe the most elaborate package we’ve ever made for a trio of films. It’s beautiful, and it is the definitive version. And there isn’t really any way, at the moment, reasonably, to stream a signal, uncompressed, that is anything like what we can fit on a Blu-ray. Compression improves constantly, and the [current] renderings are amazing. I watched FilmStruck on the Criterion Channel on my 11-foot screen with the same projector we look at our DCPs and Blu-rays on, and it holds up great. But if you’re really looking for the highest fidelity, we’re still going to make those editions for you in a way that I think that will still be compelling. I would wager that our physical media editions are only going to get better over time. And we’re going to keep making the right editions. My hope is that [Criterion on FilmStruck] will be an additive experience, both for basic FilmStruck subscribers, who already have access to that service, and for our core physical media audience. There are things that we’re going to be able to produce on the channel that we could never publish on a disc, either because we couldn’t get rights to those films or because within the scheme of our physical media schedule, they wouldn’t necessarily muscle their way in. We can take more chances in some ways. Filmmaker: Like what kind of chances? Becker: We can have a stronger emphasis on contemporary films, which has always been a part of the mission, but it’s been very hard part to fulfill, because early in their lives, first-run films are usually distributed on home video by their original theatrical distributors. There have been a few exceptions to that rule — IFC’s been a great partner for this kind of thing. But [we have access to] a much broader pool now. There will be a lot of things happening on the channel that won’t be happening in the physical media space. By the same token, if we weren’t actually producing [physical media], doing these 4K restorations, it would be almost impossible to generate the amount of content, the quality of mastering, and the experience that we’re going to be able to deliver on channel. So, I don’t think it’s a matter of cannibalizing. This is an expansion, and it is an addition. Anecdotally, there seem to be a lot of people who are excited about the idea that they can shop around. Some people like to watch movies before they commit to buying them, right? I would wager that there are films that you might discover on the Criterion Channel that you never knew you wanted in your collection, but you might, you know? Berlanga’s The Executioner. That’s my prediction for you — a great, great, very little known film. Filmmaker: Speaking broadly, for Criterion right now, what are the challenges, whether it’s in the physical collection or in the streaming service, that you have to get past right now at this moment in history? Becker: Well, the film challenges are the same always. We made a commitment very early on to present films as their makers want them seen. That means they have to be involved. That means if they’re alive and busy we have to work around their schedules. If they’re not alive, we have to figure out who the best people to speak for their intentions might be, whether they be collaborators of theirs or scholars or archivists who have actually been working with the films themselves. Often, it’s a combination of all of those things. So those challenges remain the same. Finding films remains a challenge. There are films for which we know where the negative is and know we can’t get access to because of some unpaid bill or some international relations issue between the U.S. and Iran. There are lots of challenges like that, and those are the same, whether we’re making physical media or making a channel. The channel by itself couldn’t afford to pay for all of this work because we have exactly zero subscribers as of today. So the physical media schedule is very important; as I say, it’s a driver. It loads the channel, and the physical media theatrical schedules are what support these major restorations. There are, thank goodness, many, many more good restorations happening around the world as more and more international rights holders start to take an interest in their back catalogues. We participate with lots of our licensors to help them take care of their catalogues. So those challenges haven’t really changed that much. I think the specific challenges that the channel poses are how to take a fresh look at something that is done a certain way. Like we all know what a streaming service is supposed to look like. You go there, it has a bunch of posters on it, and you choose one, right? Okay, but what if we didn’t do that? Well, suddenly, the world’s wider, more exciting, more engaging. I think the challenges are going to be about being bold enough and ingenious enough or inspired enough. We want to make something really exciting, useful — something that feels super fresh now. And I hope, five years from now, it feels like it was the obvious thing to do.